The big picture: Greater storage density in data centers will lead to better cloud services that are used by regular everyday people. As cloud integration becomes the norm in business applications, there is an ever growing need for more storage and a need to physically fit the required mass amounts of storage into data centers. Intel has had a difficult time getting its solid state drives into the hands of enthusiasts due to strong competition from Samsung, but the enterprise market is an entirely different story. Performance and storage density for an entire server rack is more important than the individual drive cost. Sharing great resemblance to a standard 12-inch ruler, the Intel SSD DC P4500 has a 32 terabyte capacity. Stacking 64 extremely thin layers of 3D NAND, the P4500 is the world's densest solid state drive for the time being. If the entire US Library of Congress were to be digitized, Intel's newest SSD could hold three copies of all the data. 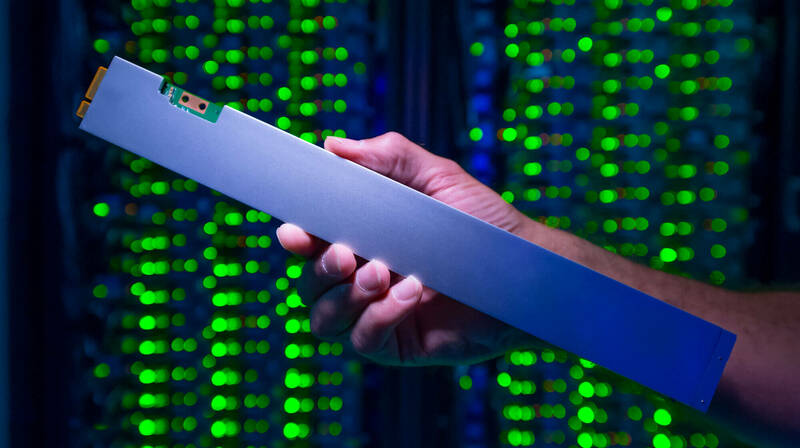 Thanks to the unique form factor and passive heatsink that runs the length of the drive, data centers can pack up to 32 ruler-shaped SSDs into one server slot. Up to one petabyte can now be put into a single slot with very light airflow requirements. Wayne Allen is the man responsible for leading the team that has developed the latest innovation in data center storage. His development group has worked with industry customers to create the ruler SSD that is now known as the Enterprise & Datacenter Small Form Factor (EDSFF). "But because [the ruler] impacts everything about server design and helps increase performance and reach new levels of density, it’s a big deal. We’re redesigning the data center with this — that’s the most fun part of it for me." Intel has not yet released performance metrics for its ultra-dense SSD, but based on lower capacity drives in the same series, enterprise customers will not be disappointed. Sequential read/write speeds of a similar 8TB model are rated at 3,300 MB/s and 1,900 MB/s respectively. Endurance is rated at 0.75 drive writes per day for random reads and writes. Sequential operations can be performed at a rate of 4.62 drive writes per day on the 8TB model. Compared to a more traditional hard disk drive, Intel's latest SSD uses ten times less power and takes up one-twentieth the amount of physical space inside an enclosure.